Twenty-one sixth-grade students from Mr. Joseph Dooley and Mrs. Karen Rutledge’s classes at Dutch Broadway School were honored by 19 local veterans for their community service on April 20. These students, under the supervision of physical education teacher Deb Bennett, are responsible for collecting recyclable bottles and cans each Wednesday from every classroom in the building. The students sort them to make sure only redeemable bottles and cans are bagged before retired Marine Veteran Bill “The Can Man” Urianek comes to pick them up. They then put all of the bags filled with the recyclables in his car. Bill recycles the bottles and all the money gets donated to various veteran organizations, such as Building Homes for Heroes. Since the program’s inception in 2013 Dutch Broadway School has collected more than 120,000 bottles and cans. Bill was so impressed with this years’ group of students that he felt the need to recognize their efforts. After speaking to the audience about the recycling program, each veteran presented the students with a volunteer service medal. Mr. Urianek also presented a plaque to Principal Amy Buchanan, recognizing Dutch Broadway for its years of participation in the recycling program and the school’s dedication to all veterans. 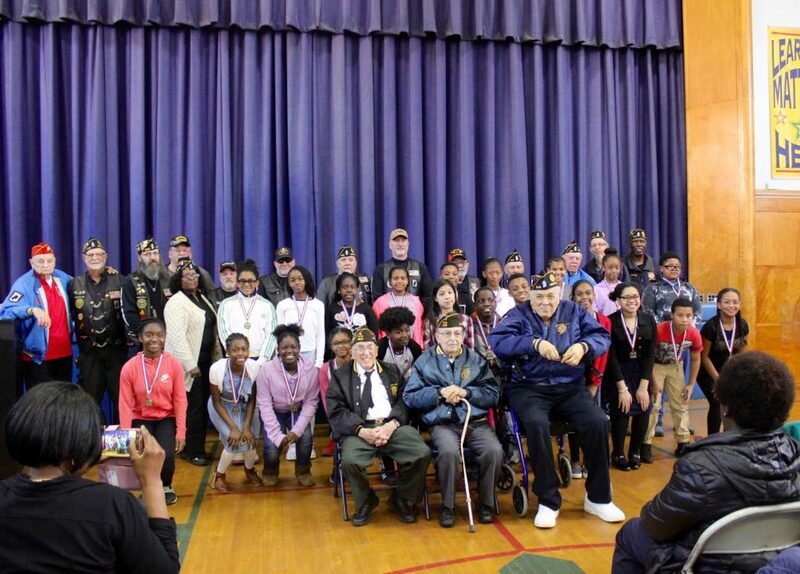 Photo Caption: Dutch Broadway School students from Mr. Joseph Dooley and Mrs. Karen Rutledge’s classes are pictured with local veterans, who honored the students for their community service.